Today there were no clouds in the sky! 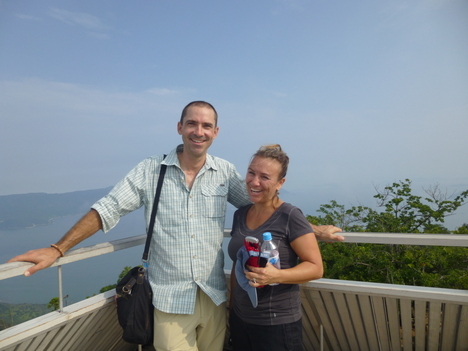 The couple from Australia were very friendly, cheerful and active. 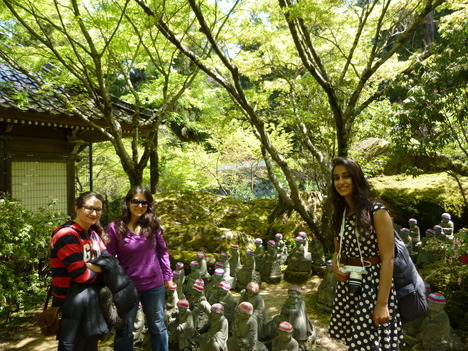 They enjoyed walking around Hiroshima and Miyajima so much. 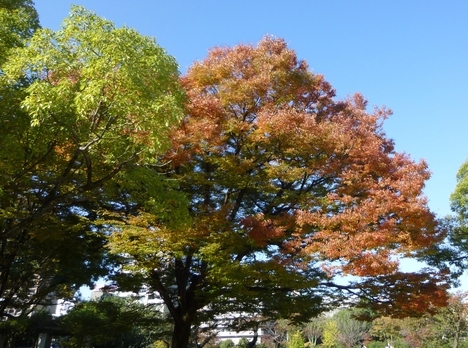 The leaves of the trees in Peace Memorial Park have already started changing their colors. 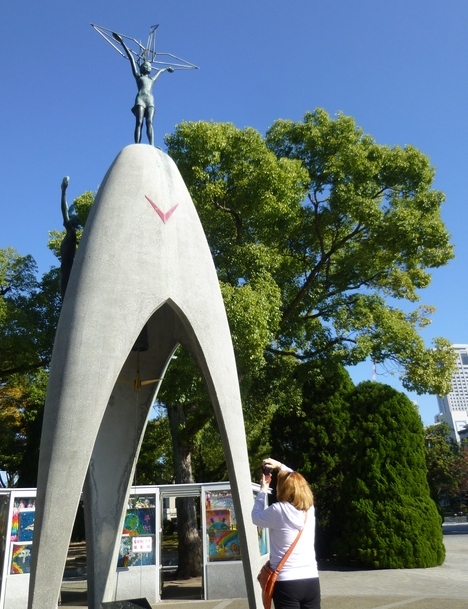 This is the most famous monument in the park which is dedicated to a girl named Sadako, and other children who died of leukmia and other a-bomb related diseases. 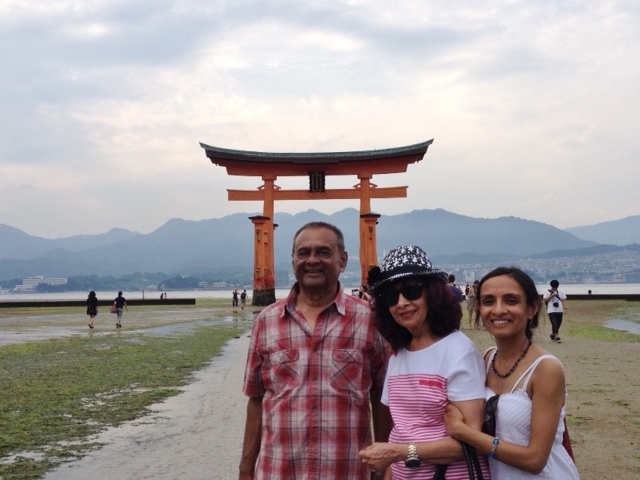 We visited Miyajima island when the tide was becoming lower. 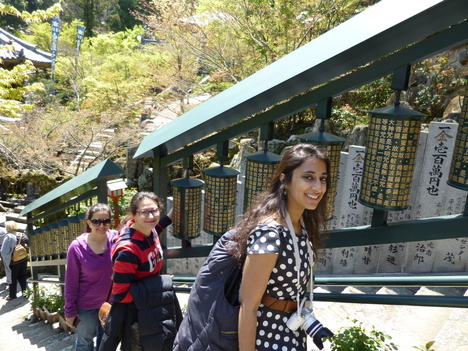 We took a ropeway to Mt.Misen. The view was really wonderful!! This is "Fire of Oath" at Shishiiwa Ropeway Station. They lit up the fire together to again pledge their eternal love! Look at their lovely smiles!! 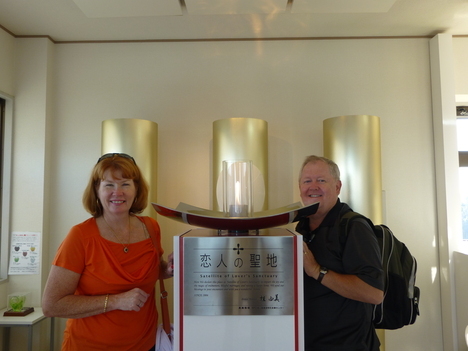 Thank you very much for joining the tour, Marcia and Robert. 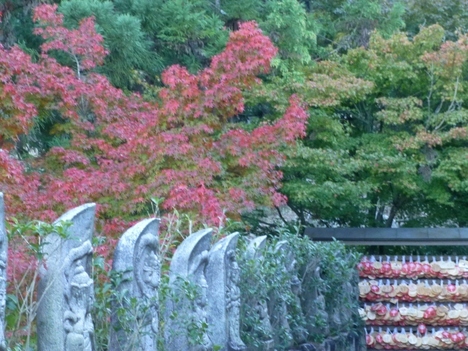 The maple leaves in Daishoin Temple have also started turning red. 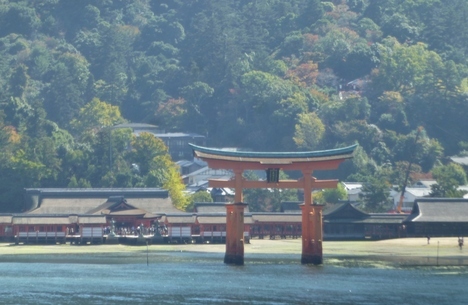 Miyajima will be very crowded soon with a lot of people visiting to enjoy autumn leaves. 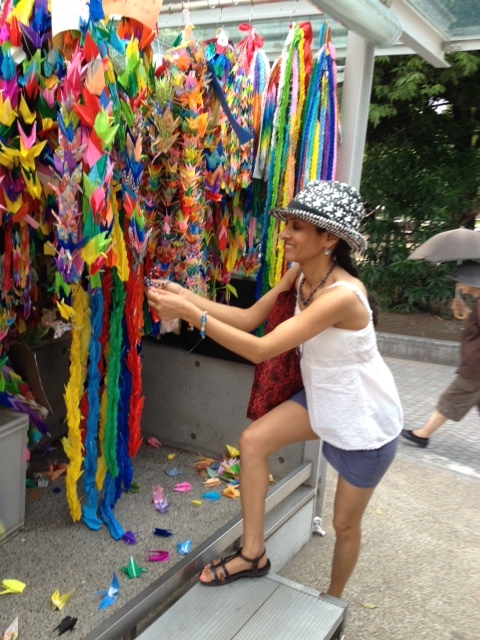 This lady from UK is offering paper cranes in front of Children's Peace Monument in Peace Memorial Park. 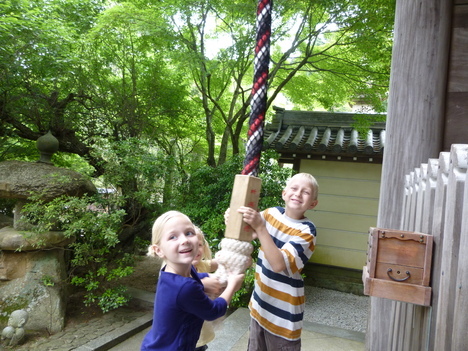 She loves and cares her parents so much that her birthday present to her father this year was "a trip to Japan"!! 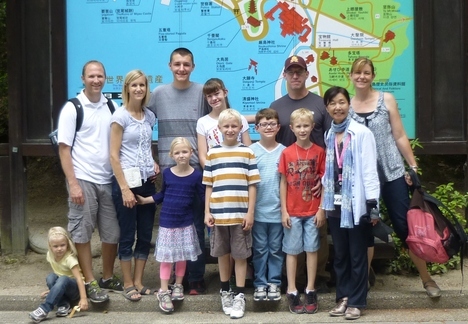 She made an amazingly detailed plan for her parents hoping they would have a comfortable and relaxing tour in Japan. I was very impressed with her deep love and devotion to her parents. 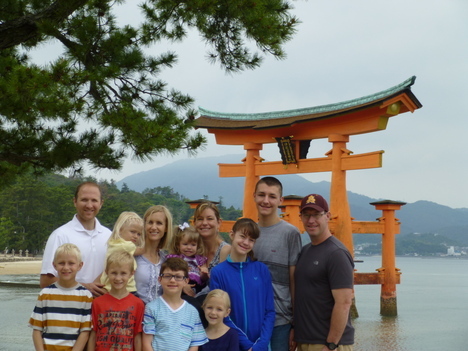 After we enjoyed vegetarian version of Hiroshima specialty Okonomiyaki, we visited Miyajima island. 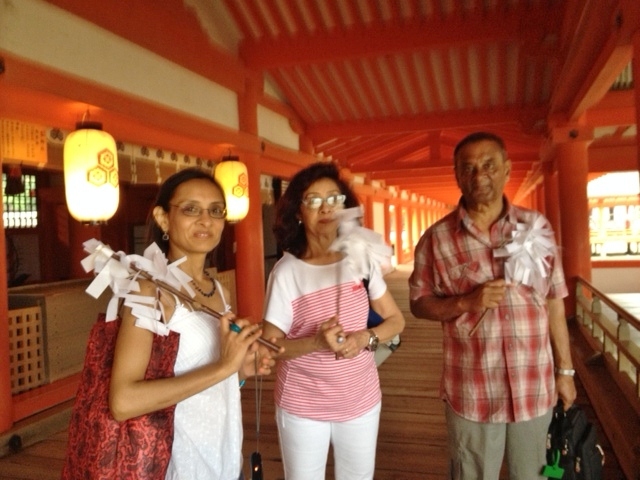 They seemed to enjoy trying quite a new religious practice at Itsukushima Shrine. Her parents always looked really happy with their loving daughter! After returning to London, she kindly posted this warm comment on Trip Advisor. Thank you so much, Ms. Sajni. I hope you will visit Hiroshima again in near future!! 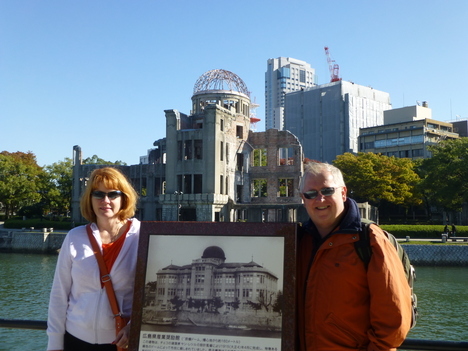 We did a whole day of touring starting with Hiroshima Memorial Park. 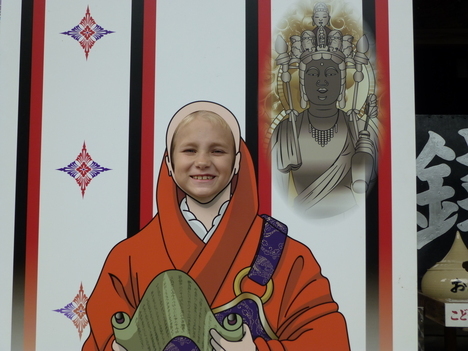 Nobuko was informative, interesting, had lots of historical facts and stories to recount right from the entrance all the way through the museum and into the park. 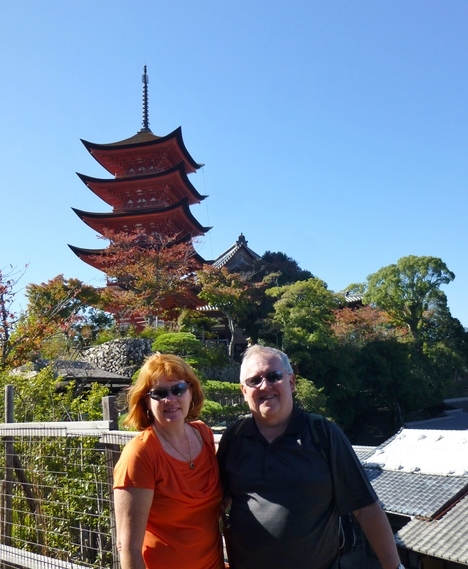 I thinking walking around with Nobuko made the experience all the more special. We made lots of different stops in the Park as she remembered some of the areas I'd mentioned I wanted to visit. 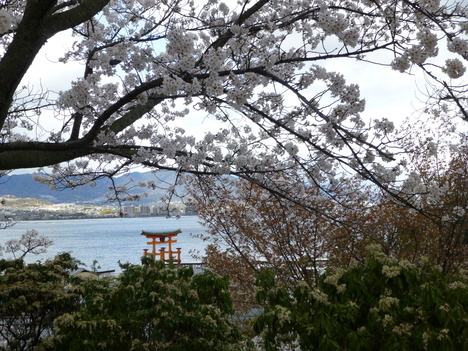 After a few hours around the Peace Memorial Park we headed to catch the JR Ferry to Miyajima. Before we boarded though, we stopped for some wonderful Hiroshima-style okonomoiyaki. How lucky were we to have Nobuko who translated the fact that we were vegetarian and therefore we managed to enjoy the vegetarian versions which were excellent! Then onto Miyajima - What an amazing place especially with Nobuko who continued recounting facts and explaining rituals and history. 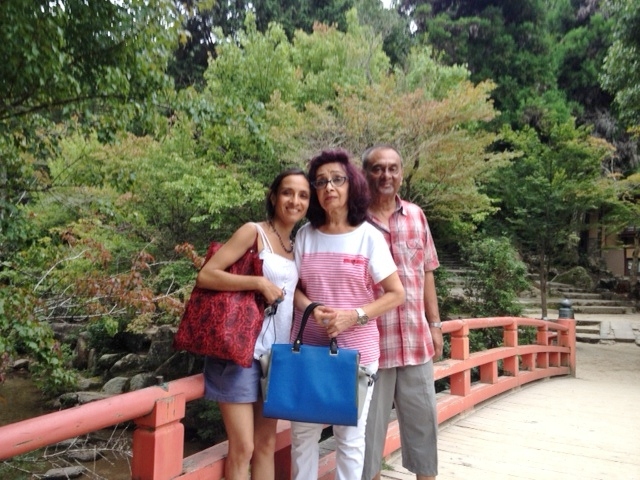 We went to the Itsukushima Shrin, Daisho-in Temple and walked past Senjokaku and the five-storied Pagoda and the red bridge in the Maple Forest.To finish off the day, Nobuko treated us to some tea and maple cookies. Thoroughly enjoyed the day and do wish that in hindsight I'd split Hiroshima and Miyajima to take it all in more, nevertheless Nobuko did a great job and I highly recommend taking this tour. Thanks Nobuko! 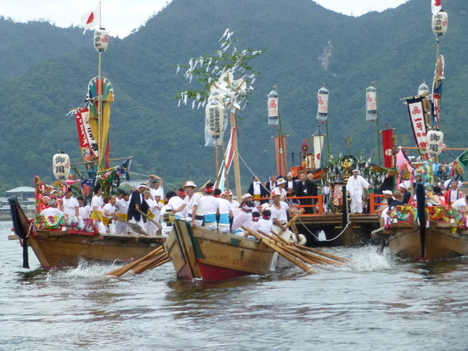 It's the most popular summer event in Miyajima. 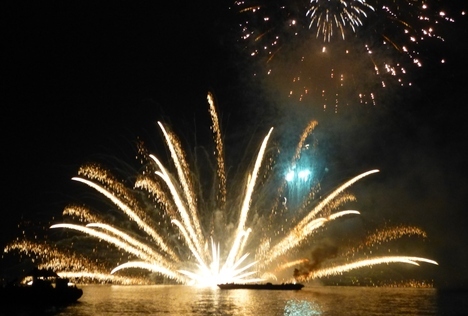 So many people visited the island to enjoy this gorgeous spectacular in the night sky. One day tour on August 6th. Today is the 69th anniversary of Atomic bombing in Hiroshima. A great sculptor Kevin and his wife Jennifer wanted to be here at Peace Memorial Park at 8:15 attending Peace Memorial Ceremony. They tried hard to fold a paper crane to dedicate to the victims. 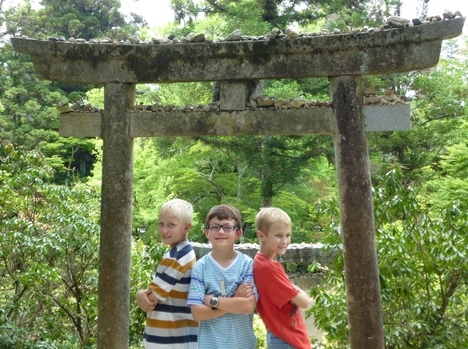 They also spent a lot of time to learn about A-bomb at Peace Memorial Museum. 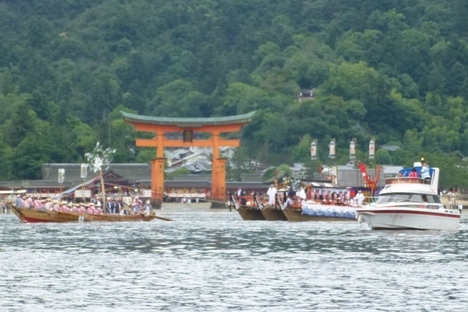 In the afternoon we went to Miyajima by cruising boat. 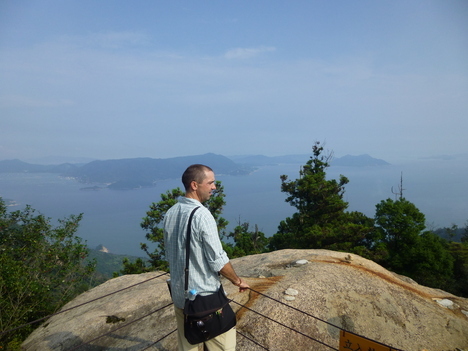 The view from Mt.Misen was fantastic. 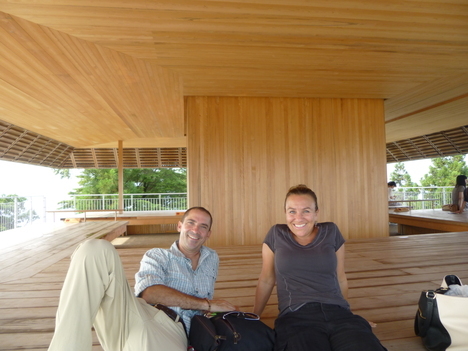 They had a relaxing time at the newly built observatory. 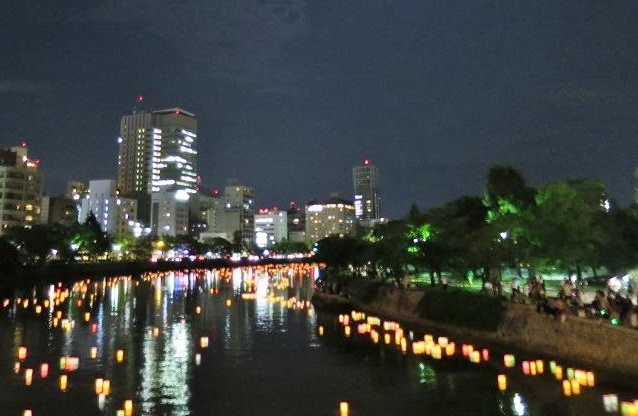 In the evening they returned to Peace Memorial Park to observe "lantern floating" on the river. 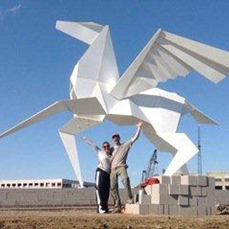 They have a wondeful GARDEN " Origami in the Garden" to exhibit Kevin's art work in New Mexico. 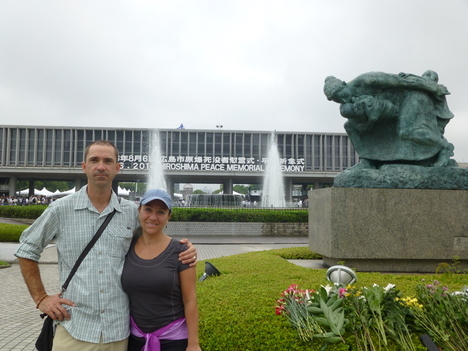 Jennifer and Kevin, thank you very much for attending our tour!! I believe you will come back to Hiroshima again in near future. So cute and lovely that I really had a happy time with them. but I believe their friendship will last forever. 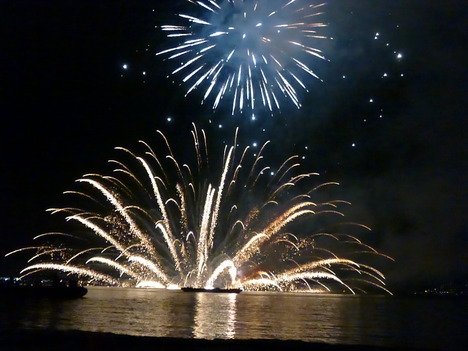 Thank you for the nice meeting and please come back to Miyajima again! two young ladies found it and decided to join the tour. 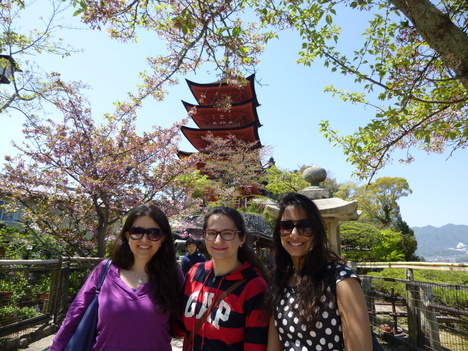 their interesting experiences during their traveling in Japan. the other ladies are best friends from Dubai and US. 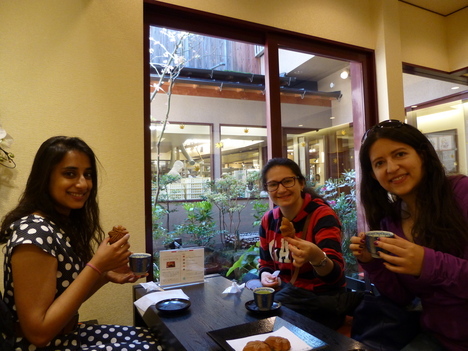 with Miyajima's special sweet "Momiji Manju". Thank you for our happy meeting!! 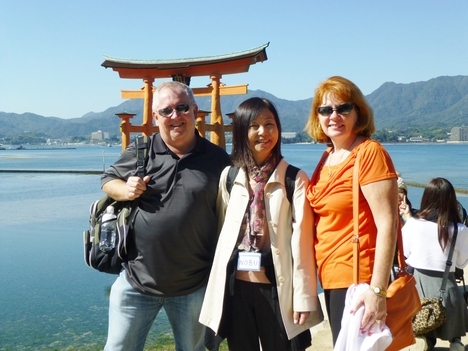 We are national licensed tour guides for English speaking people. 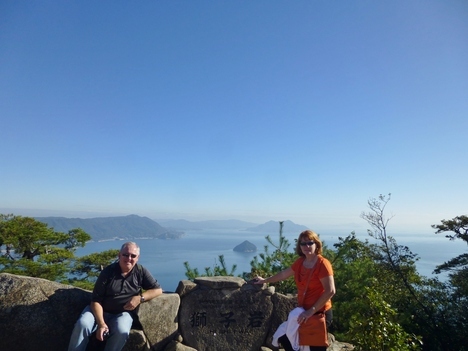 We would be very happy if you visit Miyajima and join our walking tour.